As a runner, events like this have a special appeal for me! Royal Caribbean is combining special events for runners and the amazing experience of a Caribbean cruise on one of two of the largest and most well-apportioned ships on the sea, the Oasis of the Seas and the Allure of the Seas. Read on after the break! The people at NCL took a chance and had a preeminent American artist design the hull art for the new Norwegian Breakaway. 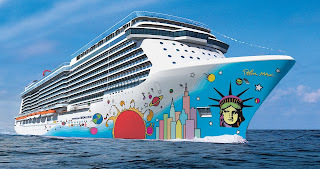 If you've been living in a travel cave, the Breakaway will be NCL's brand new ship sailing year-round from Manhattan. This was the public's first look at what Norwegian is hoping will become a well-viewed piece of floating art, and it covers 40,000 square feet. But is it a great look for a new vessel?